The program ‘Turin. Towards an accessible city’, comprises over 170 appointments – about sixty of which are dedicated to design – and involves more than 150 institutions, both large and small, a demonstration of the attention the cultural scene in Turin dedicates to the theme of accessibility, a concept broadened to reflects on how to overcome social, economic and cultural barriers. In Turin, throughout the month of October, workshops will be held, together with theatrical performances, concerts, film screenings and exhibitions. Many of the initiatives in the program are defined as “pathways”: “These are visits to museums, archives, libraries or tours of the territory, in groups and accompanied by guides who will help participants grasp the essential aspects of an exhibition, discover new ones, experience them from different perspectives”, Francesca Leon, Municipal Councillor for Culture, explains. “Some of these, although designed for people with disabilities, can be attended by anyone. In the European year dedicated to heritage we have chosen to work on the theme of universal accessibility related to structures, services and cultural activities in the hope of stimulating cultural institutions to open up to new audiences”. Sharing thoughts, skills and experiences is the best way to overcome barriers that hinder cultural participation. It is with these intentions that the Municipal Administration has committed itself to involving institutions, associations, museums, theatres, libraries, public and private cultural institutions. 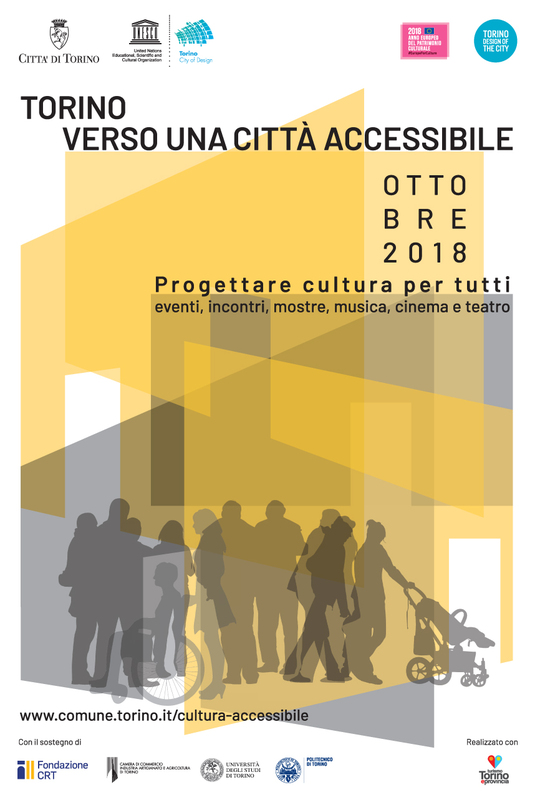 Throughout the month dedicated to heritage, the city will host, in different locations, from the 12th to the 21st of October, the second edition of “TORINO DESIGN OF THE CITY 2018”, with about 60 appointments all revolving around heritage and universal accessibility related to structures, services and cultural activities, i.e. the ability of institutions to open up to new audiences and work on their relationship with their tangible and intangible cultural heritage. An international event whose success last year has been an impulse to continue working to redesign Turin starting from the needs of people, planning services that are the result of shared processes, designed together with citizens and communities of the territory and enhancing diversity as an element of innovation. There will be moments of reflection, dialogue and discussion with experts, institutions, associations and networks in various places of the city that will culminate in the INTERNATIONAL FORUM ON ACCESSIBILITY hosted in the Aula Magna of the University of Turin on October 16th and 17th. A two day event – with representatives from the cities of Copenhagen, Montreal, Graz, Barcelona, Bologna, Carrara, Fabriano, Milan, Parma, Pesaro, Rome and Alba – to pose the question on what the terms accessibility and inclusion mean in a metropolitan city, which obstacles have been overcome and which still represent barriers to be eliminated. We will listen to examples of good practices carried out by other cities, we will take a look at the state of the art our city and, with the help of experts and the participation of those interested in the topic, the meeting will try to outline a roadmap and policies to be implemented so that culture – whether material or immaterial – and cultural heritage may become a common good, open and enjoyable by all. It will be the first public step along a road that leads to a deeper and more detailed attention to the issues of accessibility in its various articulations: economic, cultural and social, sensory, cognitive, physical and perceptive. If accessibility becomes a meaningful condition also for heritage, identifying the obstacles that hinder its everyday and conscious fruition becomes a priority for us all. “The Forum on Accessibility represents a formidable opportunity for discussion, a moment in which Turin opens its doors to innovation with a wide-ranging reflection on the future we want, because culture is creativity without boundaries or barriers,” says Francesca Leon. “In fact, participation will be key to accessing the heritage of ideas”. Download the international forum program here.